(From Canon lens literature) A superior-performance lens offering excellent optics and focusing from infinity down to one-half life size (0.5x). Its nine-element design features a floating optical system, which ensures top-notch performance even at close focusing distances. Light and compact, it functions beautifully as a general-purpose normal lens. The optional accessory Life Size Converter EF enables focusing down to life size (1:1), and actually increases working distance - very desireable in close-up shooting. Good quality overall. Light weight, easy to use. If you are used to USM lenses, this focuses less quickly and with more noise. It's better than most other non-USM's though. Perhaps quality varies from sample to sample with this lens as it seems to others. My one seems to be a very good one. From the first time I tried this lens, I was surprised almost to the point of being shocked at how good it was compared to what I was expecting from a roughly $200 new cost lens. I've not seen the quality of this lens exceeded in any lens costing anywhere near it. The lens is decently sharp at 2,5 and once at 4,0, it's terrific all the way up. 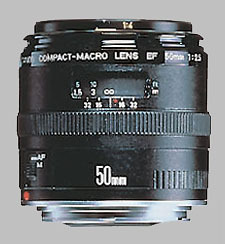 I have successfully used this in macro shots as well as general 50 mm use on my FF camera. If given a choice between saving some money and the f 1.8, I'd go with this lens. If it was between this and the f 1.4, it'd depend upon my choice of low light or macro. I also think my example is better than the f 1.4 I had for a loan a while back. Personally I'm very pleased with this lens. As my new 5d2 can shoot high ISO's well unheard of only a short time ago, the roughly 1.4 stops from here to the f 1.4 isn't relevant to my needs where the macro is of great use. Of course, if you can have it all, then the 100 mm or 200 mm macros with the 1.2 are the way to go. For us, who are on a budget, this lens does a heck of a lot. This lens is optically simply excellent. Sharp, clear, good contrast and colour. And because it goes to 1:2 macro it is much more versatile than the other fast 50s. I like it, but it just doesn't fit my needs. I really wanted 1:1 macro so have gone with a 100mm. But if you don't need to get super close to your subject (flowers, for example) it really is great. And f/2.5 is quite fast, especially because the 50 1.8 and 1.4 don't really get sharp till around f2 or 2.5. It has great bokeh for close ups and good bokeh for more distant subjects like portraits. I've had this lens more than a decade, and I still use it more than any other (though I have a EF-S 60 on the way, so that may change tomorrow). When used alone, this is a superb lens for still subjects. It's not a true 1:1 macro, but it is great for photographing smaller items (coins, jewelery, etc) and perfect for copy work. It's tack-sharp across the frame between F/4 and F/8, and has negligible vignetting, CA or distortions. What's not so great about this lens is its very slow focus motor speed. The little noisy motor can be frustrating when the lens AF decides to hunt in low light. If you buy this lens, use it for what it is, don't waste money on the "life-size converter". Adding the converter gets you effectively 70mm f/3.5 but reduces sharpness and contributes significant chromatic aberration. Not only that, but you lose the ability to focus at infinity, but that's not the dealbreaker, the purple fringing is. Put the extra money towards a longer focal length macro lens instead of the converter. Canon's 100mm USM macro and Sigma's 105mm both seriously outperform the 50/2.5+converter, FYI. The lens is actually not a real 1:1 macro but a 1:2 macro. You would need a converter. Therefore the Sigma 50mm macro might be a better buy. I think this lens severely need an update. It's build quality is not up to modern standard. This is a great lens from canon, Well built and sharp as a tack. The only thing to keep in mind with this lens is that it does not focus to true 1:1 macro, only 1:2. This may or may not be an issue, but most 50mm macros competing with this lens will go to 1:1. Overall I would easily recommend this lens though, its great if you are in need of a 50mm lens. Good value, bitingly sharp, flat field. Noisy AF, light but rough manual focus. A workhorse lens for use on a copy stand. I also used this lens hand held for nature details. Often used in manual focus mode when the focussing ring can be spun round with a fingertip, it is so light. Sometimes used with a 25mm extension tube for 1:1. Well shielded front element so no flare problems. Was used to take a photo that appeared in Nat Geo. One of the sharpest lenses I have used. I use this lens for underwater macro work, most of the time with its life size converter. The photos are amazing, but this lens makes taking them hard work (with the lifesize converter). The AF is so slow in low light that I have extra focus lights strapped to the camera housing to give this lens something bright to look at while the motor is pumping. Some shots were missed because the lens hadn't found the focus yet. Without the converter it's much easier to work with, as the AF is faster. We really need this lens with quiet USM focussing, as it makes an annyoing whirring sound when focussing. Small wildlife get often scared and scurry off before you can press the shutter. But even with all the handling problems you can't beat the results : Incredible photos! The build of this lens is very good. it has a very long travel focusing mechanism that is smooth and precise throughout the entire range. The front of the lens extends about the entire length of the lens, making the lens double the length when focused to its closest distance. The image quality is top notch. Wide open it has great sharpness from corner to corner. stopped down it gets even better. i spent a week in Yellowstone / Grand Tetons and this was the lens i found myself using the most. I have used this lens with extension tubes and the mt-24EX twin light. With tubes you have to get really close to your subject but i had no problem, even when photographing bugs. Great lens for walkaround purposes. it combines the popular 50mm length with great focusing and macro abilities. however if you need lowlight then this may not be for you.